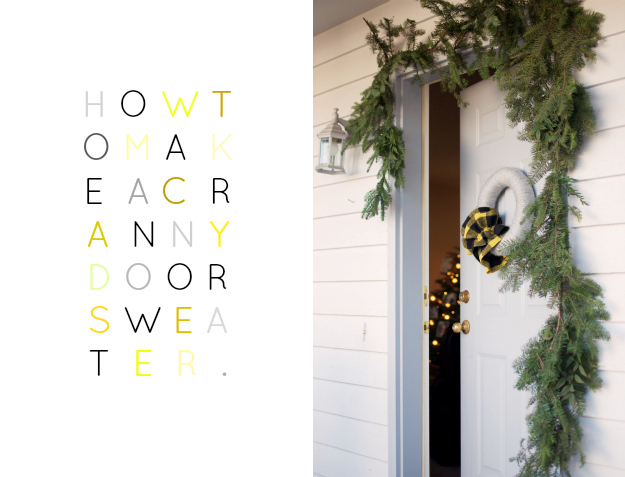 Over the last several weeks, either through my Instagram feed, this blog, or just in conversations with friends, the subject of how to make a Cranny door sweater has popped up. And so, here is a simple tutorial just for you. (I have to be honest, I do things a little bit differently for the door sweaters that are sold in my shop. I can't give all of my secrets away, right?) My favorite Cranny door sweater yarn and ruffle combination, currently, is this one. However, I didn't have any red velvet on hand and decided to use another favorite fabric and yarn combination for today's tutorial. (p.s. 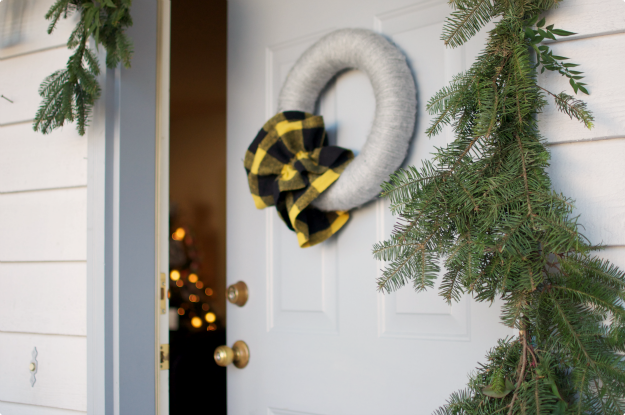 I love this over sized yellow and black checked fabric so much that it also has doubled as our tree skirt!) I promise you, if you can sew one straight line, you've got this thing covered. Ready? Here's what you need to know. 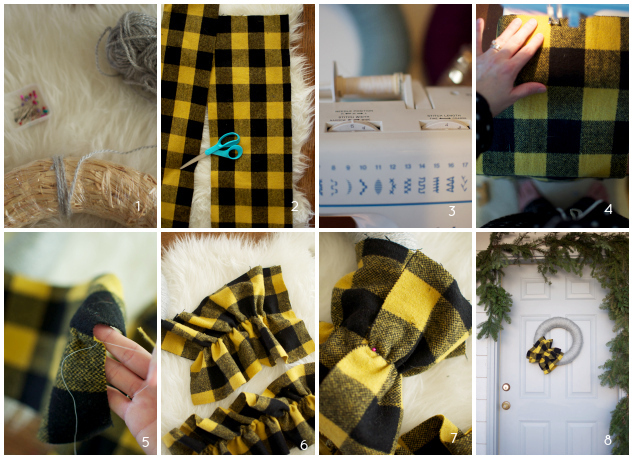 . .
// 1 // Begin wrapping your wreath by tucking the tail of the yarn under three or four wraps of the yarn. I've found that the most effective way to wrap a wreath is just by pulling the entire skein of yarn through the wreath each.and.every.time. I know. (But, hear me out: when I first began making yarn wreaths, I wrapped them in different segments with several long pieces of yarn. My yarn tangled easily and it did not give the wreath a solid look. So, no bueno.) I recommend wrapping your wreath three times. I know, I know! 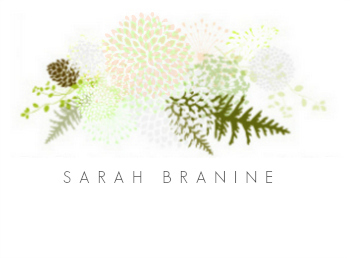 The good news is that your wreath will look marvelous when you are finished. You won't have hands left, but you'll have a great looking wreath, ha! 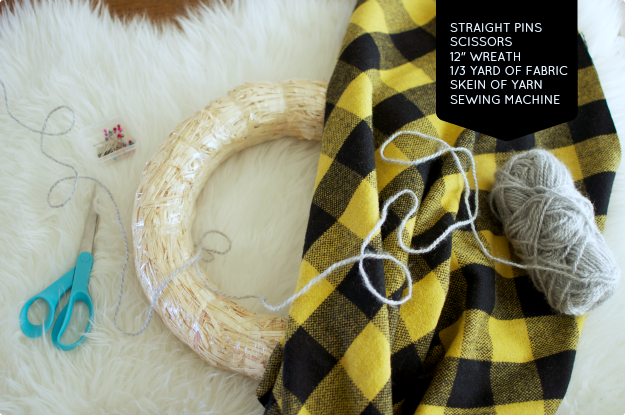 // 2 // After you've finished wrapping your wreath, cut two pieces of fabric, 5"x24", and 8"x22", give or take. // 3 // With your sewing machine on the highest tension + stitch settings, // 4 // sew a straight line down the middle of each fabric piece, making sure to back stitch at the beginning, but also making sure not to back stitch at the end. Leave a 6" tail of thread at the end. // 5 // Find the bottom thread of the tail and begin gently pulling, creating a ruffle in your fabric. // 6 // You should end up with two nicely ruffled pieces of fabric! Secure the ends by tying a knot with the threads. (Measure the pieces around your wreath before tying the threads off. // 7 // Attach the larger piece first, securing it with a straight pin, followed by the same process with the smaller ruffle. // 8 // You're finished! Thank you for the tutorial!!! I love your door sweaters, and I especially love what you've done to decorate your front door! Amy, you are so welcome! I have a confession: this door sweater is not really hanging on my door-- a $5 target wreath, from last year's after-Christmas sale is, ha! I was just telling my sister this morning that, I think I've made so manny Cranny door sweaters that I just make them for other people now instead of having them in my own home. Kind of like the cobbler's kids have no shoes I guess : ) Silly me. I love this! Thanks so much for sharing such a great tutorial. I think making one will be in my very near future. Rachel, you are so welcome-- so glad that it will be useful to you! Beth, you are very welcome! And, yay for yarn letters. I love them in littles' rooms too : ) I hear you-- crazy good times for sure!